A while back my friend Cal Spitzer emailed this snazzy 8x10 publicity shot of the delightfully named (and delightfully shod) Stark Naked and the Car Thieves. 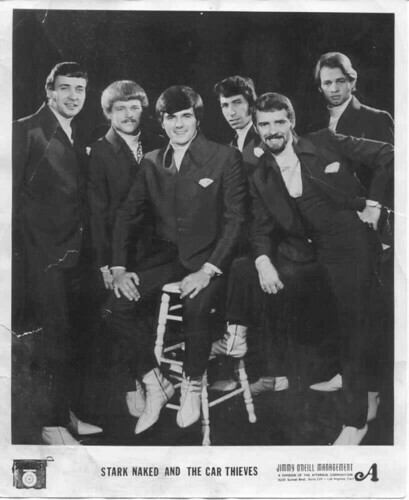 Research reveals that this combo had its beginnings as a conglomeration of several Indianapolis area garage and doo-wop groups, finally relocating to Los Angeles where they accumulated several minor hits and a rotating list of members. Despite the wild name (and a reportedly crazy Vegas stage show), their surviving recordings are decidedly tame. Further research reveals that their name was eventually stolen by a New Zealand band who went on to record a minor hit cover of another name-thieving band: the Monks' (UK) "Nice Legs, Shame About the Face." The thing that really struck me, though, is the small print: SN&CT's booking agency is listed as "Jimmy O'Neill Management."